It's hard to imagine an app that can rival Chistoph Niemann's Petting Zooin novelty and engagement. There's now a contender. Christoph Niemann's Petting Zoo featured 21 whimsical animals, each with the potential to morph into shapes and animations triggered by viewers. At the time, apps were something new for this author/illustrator/graphic designer, who, in a New Yorker article "The Story of My App, documented his path from artist with an inspiration to app creator who learned how "insanely difficult" it was to make the product he wanted. Petting Zoo was a huge success, no surprise given Niemann's talent. It was hard to imagine another app that would rival the novelty and engagement of Zoo anytime soon. Well, there's now a contender, and it's titled CHOMP. Christoph Niemann’s latest production, CHOMP (Fox and Sheep GmbH, iOS, $2.99; Android, PreS Up) is designed for children, but one that teens and adults will find as much fun—and as addictive—as youngsters. The interface is simple and easy to navigate. Niemann has provided approximately 60 hand-drawn, clever templates, each featuring a cut-out paired with an amusing animation. Users position the device's camera so that a face appears in the cut-out—either theirs or another person's. 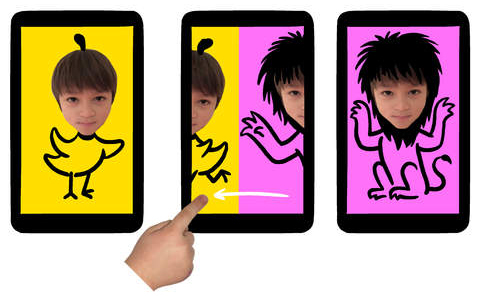 By tapping the screen an animation will begin. For example, with faces in place, a drummer plays a set; a strongman, dripping with perspiration, lifts weights; a musician belts out a tune on a saxophone; a faucet drips a photo; the head of a robot springs a gasket, and a shark chases a swimmer around and around in the water, then dances on his or her head. Chomp is brilliant. It is quite clever in it's execution. My kids loved it. Brought fits of laughter.